It boggles the mind to think that the United States now has the highest corporate tax rate in the industrialized world. But it’s even more amazing that America arguably has the most punitive corporate tax rate in the entire world. Here’s some of what I wrote on the topic for today’s U.K.-based Telegraph. …the United States has the highest corporate tax rate in the developed world (and the highest in the entire world, according to KPMG, if you ignore the United Arab Emirates’ severance tax on oil companies). …The central government in Washington imposes a 35pc rate on corporate income, with most states then adding their own levies, with the net result being an average corporate rate of 39.1pc. This compares with 37pc in Japan, which has the dubious honour of being in second place, according to the tax database of the Organisation for Economic Co-operation and Development (OECD). …if you broaden the analysis, it becomes even more evident that the United States has fallen behind in the global shift to more competitive corporate tax systems. The average corporate tax for OECD nations has dropped to 24.8pc. For EU nations, the average corporate tax is even lower, with a rate of less than 22pc. And don’t forget the Asian Tiger economies, with Singapore, Taiwan and Hong Kong all clustered around 17pc, as well as the fiscal paradises that don’t impose any corporate income tax, such as Bermuda and the Cayman Islands. I also explain that America’s system of “worldwide” taxation exacerbates the anti-competitive nature of the U.S. tax system for companies trying to compete in global markets. And I warn why making “inversions” illegal is a misguided and self-defeating response. Blocking inversions…is like breaking the thermometer because you don’t like the temperature. It simply masks the underlying problem. In the long run, the United States will lose jobs and investment because of bad corporate tax policy, regardless of whether companies have the right to invert. In other words, America desperately needs a lower corporate tax rate. The crowd in Washington, however, says American can’t “afford” a lower corporate tax rate. The amount of foregone revenue would be too large, they claim. Yet let’s look at what happened when Canada lowered its corporate tax burden. Here’s a chart prepared by the Tax Foundation. The Tax Foundation augmented the chart with some important commentary on why companies are attracted to Canada. Part of the attraction is the substantial tax reforms that occurred over the last 15 years in Canada. First among these is the dramatic reduction in the corporate tax rate, from 43 percent in 2000 to 26 percent today. The U.S. currently has a corporate tax rate of 39 percent, but lawmakers are reluctant to do what Canada did, i.e. lower the tax rate, for fear of losing tax revenue. …According to OECD data, corporate tax revenue increased following Canada’s corporate tax rate cuts that began in 2000. 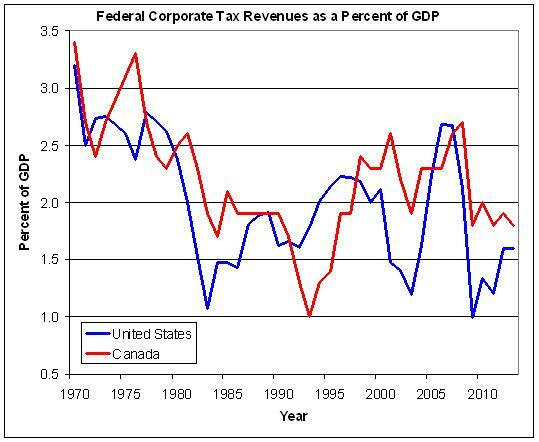 …Corporate tax revenue as a share of GDP in Canada has averaged 3.3 percent since 2000, while it averaged 2.9 percent over the years 1988 to 2000, when Canada’s corporate tax rate was 43 percent. My colleague Chris Edwards also reviewed this issue (and he’s a former Canadian, so pay close attention). 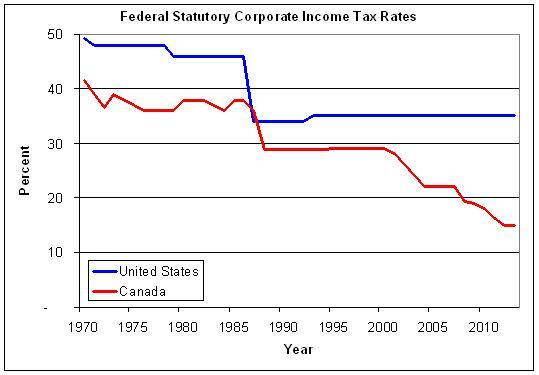 Here’s his chart showing the corporate tax rates imposed at the national level by both the U.S. government and the Canadian government. As you can see, the rates were somewhat similar between 1985 and 2000, with the Canadians having a slight advantage. But then Canada opened up a big lead over America by dropping the central government tax rate on corporations to 15 percent. So what happened to corporate tax revenue? As you can see from his second chart, receipts are very volatile based on economic performance. But the Canadian government is collecting more revenue, measured as a share of total economic output, than the American government. In spite of having a lower tax rate. Or perhaps it would be more accurate to say the Canadians are generating more corporate tax revenue because of the lower tax rate. In other words, the Laffer Curve is alive and well. Not that we should be surprised. Scholars at the American Enterprise Institute estimate that the revenue-maximizing corporate tax rate is about 25 percent, far below the 39.1 percent rate imposed on companies in the United States. And Tax Foundation experts calculate that the revenue-maximizing rate even lower, down around 15 percent. P.S. Don’t forget that when politicians impose high tax burdens on companies, the real victims are workers. P.P.S. And since America’s corporate tax system ranks below even Zimbabwe, we’re in real trouble. The best corporate income tax rate is ZERO. There are a long list of benefits. Here are some non-economic benefits: eliminating the cost of corporate tax compliance, eliminating the rules and regulations regarding non-profit companies such as section 501 corporations, eliminating a large piece of the IRS, and, with the value of tax loopholes at ZERO, there would be a great big chunk of crony taken out of capitalism. First, let’s agree that the current tax code is a destructive mess. The biggest burden is not necessarily the actual tax paid, but the time and effort required to avoid or delay payment and the overhead required for advice, lobbying, and compliance. Second, inversions would stop immediately if the US tax applied territorially not globally. Third, the statutory rate is not as important as the effective tax rate. Without lobbyists it is small businesses that pay higher effective rates. Finally, all taxes on earned income (or sales) eventually fall on the consumer. Subsequent higher prices reduce sales, hitting both salaried workers and business owners. If the corporate tax is reduced, it is likely that tax rates on salaries will increase to compensate, creating a push for higher salaries, thereby lowering pretax earnings. Unless there is a recognition that lower marginal taxes are a positive for the economy, benefiting corporations to the detriment of workers will not work. – A flat tax on sales of 25% adds 33.3% to the cost of the product over cost. – A flat tax on sales of 20% adds 25% to the cost of the product over cost. Obviously the volume of product sold in the second case will be higher and the economy will grow faster. Doing a static calculation, 8.3% more products can be purchased, of which additional tax revenue will be 2.1%, in the second case. For the more dynamic future, 8.3% more salary will be available for jobs, and the company will need to grow by 8.3% or its profit margins will improve. 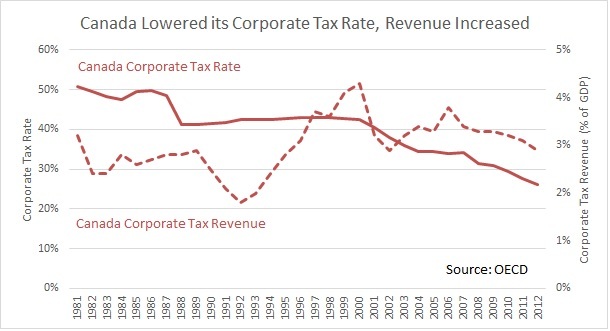 If corporate tax rates were reduced to 15% and Individual to 22% – all flat taxes, no deductions, no exceptions for anyone or anything and all regulations issued by the federal government for the past 10 years eliminated (congress can pass laws to replace not bureaucrats) then the resulting increase in business activity, money flow and production back to the USA revenues would increase over 20% to over $2.5 trillion from individuals and over $300 billion from corporations. Something over 20 million additional jobs would be created. all of this would happen within 18 months. This allows for a shrinkage of the civilian federal workforce by over 500,000.